Left: Marie and Julian Black on Black Design Pot, c. 1930, 4" x 4"
Top: Maria Poveka Pot, c. 1969, 4.75" x 5"
Right: Maria and Santana Black on Black Geometric Pot, c. 1940, 4" x 6"
Few craft artists can claim the worldwide honor and fame bestowed upon Maria Martinez during her lifetime. This modest, traditional, Pueblo woman received honorary degrees from major universities, countless medals and citations from governments and institutions, and special invitations to the White House from four different Presidents. She was one of the most famous craft artists in the world. Now, a quarter century after her death, many visitors to Santa Fe ask what made Maria so famous as a potter. Certainly the basis of her reputation was an artistic and technical ability with the clay that was unsurpassed in her time. But Maria also was an innovator—most notably inventing the famous black-on-black pottry technique—which truly elevated pottery making from craft to art. And most importantly, through her high standards and generous sharing of techniques, Maria revived the art of pottery-making among her people, reconnecting them to their ancestral form of artistic expression and traditional Pueblo way of life. 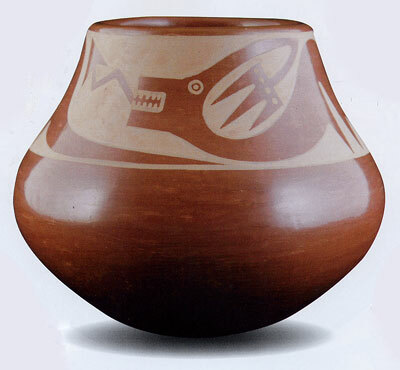 Maria’s San Ildefonso people (Powhoge in their Tewa language) had a thousand year-old tradition of pottery making. By the time Maria Poveka Montoya was born, probably in the year 1887, her small community was in the midst of great cultural change, and many traditional practices—including pottery-making—were in decline. Although many women in the pueblo made pottery, it was no longer a necessary part of daily life. Inexpensive Spanish tin ware and Anglo enamelware had replaced traditional pottery jars and cooking pots. Because of pottery’s diminished importance, many potters spent less time and effort on their work, making ever smaller and simpler pieces which they sold for a few cents to the souvenir trade in Santa Fe. Maria and Popovi Polychrome Pot, c. 1960, 5" x 7.25"
In this changing environment, young Maria Poveka Montoya was very fortunate to have as her aunt, Nicolasa Montoya, one of the finest San Ildefonso potters of her generation. Maria grew up watching Nicolasa make pottery, and at age seven or eight, Maria learned to pinch small lumps of clay into the shapes of dishes she used for play. Driven by an intense desire to learn and guided by a skilled teacher, Maria quickly developed her gift for pottery. In 1904, at about age 17, Maria was invited to demonstrate her skills at the St. Louis Worlds Fair. She already had been engaged to marry Julian Pocano Martinez in that year, and on the afternoon of their wedding day the young couple boarded a train for Missouri. At the Fair, Maria formed and fired small pots while Julian joined other San Ildefonso men demonstrating Pueblo dance customs in front of thousands of visitors from around the world. The marriage of Maria and Julian proved to be a life-long union of two deeply artistic temperaments. Julian took an early interest in the colorfully stylized manner of watercolor painting then being developed at San Ildefonso by his brother-in-law Crescencio Martinez. Dr. Edgar Lee Hewett, Director of the Museum of New Mexico, recognized Julian’s aptitude with the brush and in the first years of the century, sought to encourage his work by giving him paints and paper. With instruction and guidance from both inside and outside the Pueblo, Julian’s talents also developed quickly. Over the next several years, Julian contributed a number of important innovations to Pueblo painting such as the revival of ancient Pueblo mythological creatures. Julian’s most important contribution, however, was the combination of artistic imagination with exacting skill and technical achievement. Other artists of the day praised the sureness of hand, flowing draftsmanship, and masterful use of color which made him a stand-out in the emerging tradition of San Ildefonso painting. 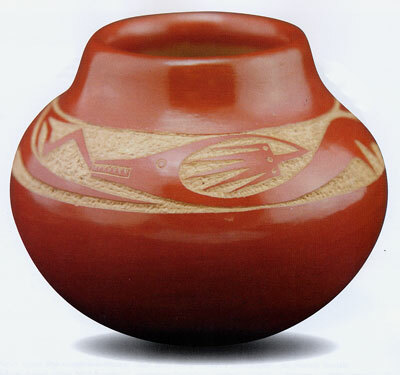 Tony Da Incised Red Avanyu Jar, 5" x 4"
In 1908 young Maria and Julian seized an unusual opportunity to unite their artistic endeavors. A year earlier, Edgar Lee Hewitt had begun an archaeological excavation at ancient Puebloan sites on the Pajarito Plateau above San Ildefonso. Hewett, who well knew of Maria’s reputation as one of San Ildefonso’s best young potters, asked if she could make bowls for the Museum using the polychrome (multicolor) designs and techniques found on the prehistoric pottery. Maria visited the excavation and showed great interest in the old pottery and excitement in the new challenge. It was probably no coincidence that Julian already had been working as a digger on the same excavation. Also fascinated by what he saw there, he began keeping a notebook of sketches derived from the newly rediscovered designs. Given Julian’s interest, and the fact that men often painted pottery for the women of the Pueblo, it was only natural that Maria asked her husband to join her in this new project for Dr. Hewett and the Museum. Thus began a legendary artistic collaboration that would transform the lives of Maria and Julian as well as the livelihood of their entire Pueblo. Maria and Julian continued to refine their pottery techniques and, within a few years, they were widely recognized as the best potters in the region. Maria distinguished her work by developing new pottery shapes that were more fluid, balanced, and elegant than the traditional forms of her predecessors. Her technical genius showed in pots of exceptional symmetry with walls of even thickness and surfaces free of imperfection. Maria was best known, however, for her unsurpassed skill at polishing, in which a damp coating of liquid clay was repeatedly rubbed with a stone, resulting in a smooth, shiny surface once the pot was fired. Julian similarly excelled in both artistic and technical ability. 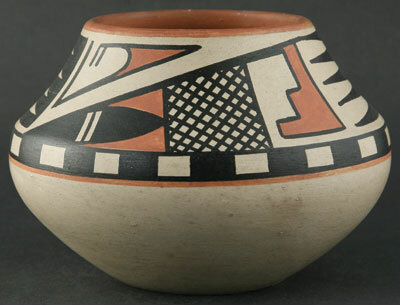 Using his experiences with the Museum of New Mexico, he adapted historic and prehistoric pottery decoration to suit his distinctive contemporary vision. His designs based on the prehistoric Avanyu, or horned water serpent, and his adaptations of the Mimbres feather pattern drawn from that culture’s ancient pottery quickly became standards of pottery decoration at San Ildefonso and beyond. Fortunately, Julian also had the skill to execute his vision with a precise, even hand that set a new standard for his generation of Pueblo painters. Maria and Popovi Sienna Avanyu Vase, December 1964, 5.25" x 6"
Of all their achievements together, Maria and Julian are best known for their invention of “black-on-black” pottery. San Ildefonso and the neighboring Pueblos of Santa Clara and San Juan had a tradition of plain black pottery that went back many generations. Maria made her exquisitely polished black ware as early as 1912, but it was not until 1919 that she and Julian began to experiment with a style of pottery in which decoration was rendered through the contrast of shiny black and matte black surfaces. 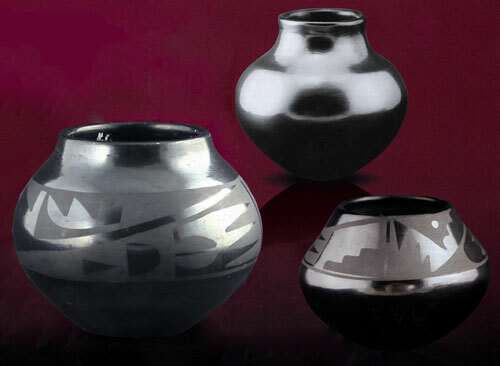 Perfected by 1921, the black-on-black process was widely recognized as the greatest innovation in Pueblo pottery in generations. Drawn irresistibly by its subtlety and elegance, non-Indian collectors flocked around Maria to buy every piece of black-on-black pottery she could make. The Museum of New Mexico collected their first of many examples as early as 1920, and Maria’s work consistently took top prizes at the Santa Fe Indian Market which started in 1922. By the early 1930s, Maria’s annual income placed her family solidly in the financial middle class, and her work had become famous around the world. Other potters at San Ildefonso certainly took note of Maria’s success. A few of them such as Tonita Roybal, Ramona Gonzales, and Maximiliana Martinez (Maria’s sister) also were excellent potters and, like Maria, had been encouraged by The Museum of New Mexico and School of American Research. But Maria’s growing fame gave the whole community of potters new visibility, new markets, and new reasons to improve the quality of their wares. In response, most of them quickly adopted Julian’s painting style and increased their efforts to emulate the grace and perfection of Maria’s potting and polishing techniques. It is a testament to Maria’s character as well as her upbringing that as soon as she achieved success, she shared her secrets with the community. “We want everybody to get something so we tell others how to make the pottery,” Maria told a researcher in 1934 about sharing the black-on-black techniques. No traditional Puebloan could separate her or his own life from that of family and village; success for one meant that all should benefit. 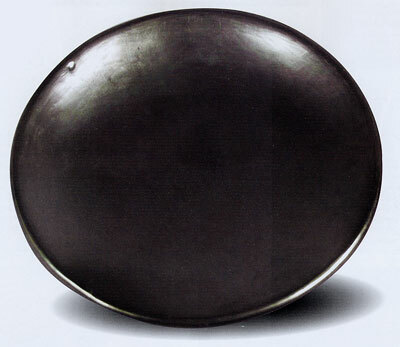 By 1925 nearly all San Ildefonso potters were making black-on-black ware. Maria Poveka Plate, c. 1960, 5"
Maria not only shared her knowledge with potters who were her contemporaries. She also encouraged young women (and, increasingly, men) to take up pottery as a livelihood by teaching pottery classes at San Ildefonso and the Santa Fe Indian School. And, of course, Maria and Julian taught their children and grandchildren the techniques of pottery-making as well as its long-standing cultural importance to their people; a tradition which they had done so much to revitalize and refine. When Julian died suddenly in 1943, Maria lost both her life-mate and her artistic soul-mate. Though devastated, Maria did not lose her resolve to make pottery. Her oldest son, Adam, took over the responsibility of digging the clay then drying, crushing, and refining it; the heavy work of pottery making that Julian had performed for Maria for nearly 40 years. Adam’s wife, Santana, took up the task of painting Maria’s large output of pottery. Santana, herself, was descended from a family of gifted potters and painters, having first learned from her Aunt, Tonita Roybal. After marrying Adam, Santana further studied under Maria, but also had the opportunity to learn pottery decorating from her father-in-law. Indeed, Santana faithfully carried on Julian’s painting style which over the previous 35 years had become a tradition in its own right. Many experts feel that the pottery made during the collaboration between Maria and Popovi (1956 – 1970) was the best of Maria’s career. Popovi inherited the sure and precise hand of his father and possessed a nearly unerring sense of balance and proportion in his designs. Also like Julian, Popovi was a true innovator in pottery design and technique, as demonstrated by the work he did independently of Maria. Nevertheless Popovi never imposed his own ideas on Maria’s pottery. He worked brilliantly but faithfully within the tradition his parents had created, always seeking to support Maria’s own creative choices and safe-guarding her reputation. In “the exception that proves the rule,” Popovi instigated one important development in Maria’s work: the return to polychrome pottery. Maria and Julian’s black-on-black pottery was so instantly and enormously popular, that most San Ildefonso potters had mostly stopped making polychrome wares by the late 1920s. Always wanting to try something different, Popovi sought to explore the artistic possibilities of this ancient technique which Maria had revived nearly 50 years earlier. Although their output of the polychrome ware was never large, Popovi had helped Maria return to the very origins of her interest in pottery making. Over the course of her 93 years, Maria witnessed a remarkable transformation at San Ildefonso Pueblo. A dying craft tradition had been infused with new vitality and creativity. The once isolated village had become an important craft center and destination for travelers from around the world, and the prosperity of the entire community increased greatly as pottery making became the single largest source of income at the Pueblo. These changes were due in large measure to the creativity, hard work, and generosity of Maria Martinez. First with Julian and then with Adam, Santana, and Popovi, she generated public interest in Pueblo pottery, raised the overall level of quality by sharing her talents and setting new standards of artistic and technical ability, and became the icon of advancement for Native American craftspeople and artists.